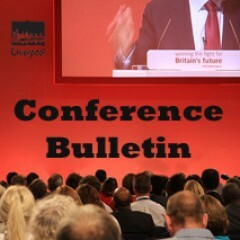 After days of frustration at continuing manipulation of the conference agenda by party managers, a “spring revolt” broke out in Labour’s conference this morning. As a number of rule changes were proposed by constituency delegates, speaker after speaker spoke to loud applause and cheers in favour of the need for fairness and justice for constituency members who are entitled to have their voices heard. Patrick Denahy from Dewsbury complained that his local party had to wait 18 months for the NEC to “carefully consider” its four line rule change, while delegates on Sunday had to approve a 100-page rulebook it had received three hours earlier. The only speaker against the mood was Maggie Cosin, leading member of shadowy right-wing organisation, Labour First. Although she serves as a latter-day Witchfinder General on the party disciplinary body, the national constitutional committee, it is hard to explain why it is necessary for her to be staying at the party’s expense in the luxury Jury’s Inn Hotel adjacent to the conference centre. The evident mood of dissatisfaction amongst constituency delegates caused a flurry of activity amongst trade union delegates — whose unions delegations had, almost without exception, decided to back the national executive’s opposition to all CLP-proposed changes. Some unions decided to reverse their decision and back some of the changes; others considered abstaining. Unfortunately, conference voting procedures which give 50% of the vote to trade unions however many votes are cast, making abstention a messy business — possible but only by getting half their delegation to vote each way. Although the rule changes were in the end defeated, this level of willingness by delegates to vote against the wishes of party managers has not been seen since the 1980s. It’d be nice if a date was attached to these articles. I assumed that this was 2013 until LabourFirst was mentioned – which has gone by now hasn’t it?